Early on, I don’t think that I made much distinction between used bookstores and those that sold only new stuff. The same was basically true of record stores. Certainly, some were nicer than others. The stock did tend to be shabbier in stores that hadn’t had a good dusting in a while. Perhaps that was because almost all of them were owned by individuals who just happened to like books or records. At some point, I noticed that the chain stores existed and they had a different smell to them. Someone had been asked to run a broom around the floor, though they may just have swept the dust into a corner. They presented their stock in a pleasing way. They also secured their stock with devices. Small independent stores relied on the manager’s eagle eye to catch shoplifters. Also, you only found chain stores in malls. But if you really liked books or records, you haunted the smaller shops. They were the ones that had piles of science fiction paperbacks alphabetized for easy scanning. They played to your budget and interest and tolerance for that mild mildew smell. Let’s face it, old paperbacks have a charm from their wild cover artwork to the varying type sizes. All I cared about was whether the book fell apart when you cracked the spine. The other thing about old paperbacks was the lack of a photo of the author. first gained my notice because he edited some short story collections. From there, I found issues of The Magazine of Fantasy and Science Fiction, a long running staple where he was the editor for years. His comments in books and magazines displayed a certain wit that appealed. Then, I read some of his stories. How could I resist someone who mixed clever with classic? He wrote mysteries and even mixed the two worlds, especially in Rocket to the Morgue. For that matter, the world mystery convention is called Bouchercon. 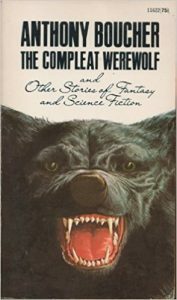 As an established fan, I found a copy of a first edition of The Compleat Werewolf in a used bookstore. What an irresistible title! They wanted $18 for it. I visited that copy for a couple weeks before breaking down and buying it. When I arrived home, I placed it on the table and just looked at it for an hour. Something about the clarity of Boucher’s prose and ease with which he sketched his characters felt like a model to me. While others drew star spanning epics, I felt like Boucher envisioned a world in which little items and regular people mattered. Literature could be created from looking at life a little askew rather than with all the angst of a national book award winner. So, I identified with someone that looked pretty much like I would at sixty if I dressed like a wacky uncle who wrote copy at at a 1950’s advertising agency. Yep, they did not have pictures in those old paperbacks. You’ve Got to Check This Out is a blog series about music, words, and all sorts of artistic matters. It started with an explanation. 61 more to go.